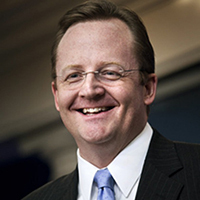 When McDonald’s selected former Obama aide and White House press secretary Robert Gibbs to lead the corporate relations function in 2015, it seemed to have at least one eye on the political and social issues that surround everything from its nutritional value to its employee practices. And while Obama has been replaced by a new president with a very different worldview and different contacts, Gibbs continues to demonstrate the importance of having a savvy political veteran and smart senior strategist at the helm of a mission critical function. He leads McDonald’s corporate relations teams, including corporate communications, government relations and external communications, and his outside perspective is a valuable asset as McDonald’s strives to become a modern, progressive burger company. Gibbs also has a deep understanding of the public issues impacting brands. Before joining McDonald’s, he co-founded The Incite Agency, a communications firm to help companies further their business goals and enhance their reputation.